Please refer to our stock # 1828 when inquiring. 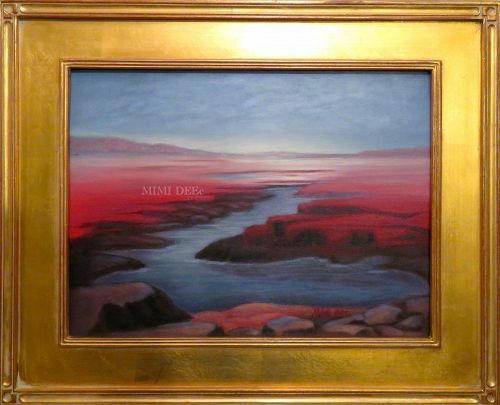 The latest original regional Cape Ann marsh landscape painting by this painter. A dramatic deep red and blue marsh with a distant luminous sliver of sky in buttery yellow was painted with a very limited palette of three pigments plus white, following a more "Modernist" feel to this while the other recently painted "Marsh Moment" - # 1340185 - using the same limited palette may have more of a traditional New England appeal. Canvas laid on professional archival Amersand museum hard board panel. Title: "Primordial Marsh" - ID# 0711160909 - No reproductions! Particulars: A very limited palette of three pigments plus white were used. Signed: Mimi Dee at lower right. No reproductions! Set Up: canvas was laid on professional archival hard board Ampersand museum panel. No sagging due to atmospheric changes, no worry of puncture damage! Please call for shipping info. Shipping without frame saves mailing fees. Original work by this self taught artist who also forges sterling silver studio metal work and jewelry, has been exhibited in various area artist association shows since the 90s and at the previously open Methuen studio store gallery by the same name. Legal: All images design concept content text solely owned by Mimi Dee. Note: Not all golden colored frames are of the aforementioned variety. The professional ones, as seen above, are closed cornered (no mitered lines) and often show overlap lines where the leafing is applied. Please see # 1340185 for another painting using the same limited palette of three pigments...yet a completely different look... in this one here... following a more "Modernist" feel - while the other recently painted "Marsh Moment" # 1340185 - using the same limited palette has a traditional New England appeal. Please search: 1340185 or see image 2 to compare the two. EXHIBIT HISTORY: Aug - Sept 2016 at North Shore Arts Association... a 501 (c) 3 non profit charitable organization, promoting and preserving the fine arts since 1922. If you saw this there, please advice as a percentage would go to NSARTS.ORG for the building restoration fund raising project.